All of your clients login to PhysiApp. PhysiApp is free, and available for web, iOS and Android. Your client will need his/her access code to log in to PhysiApp. Your client receives his/her access code when you assign the exercise program to your client. 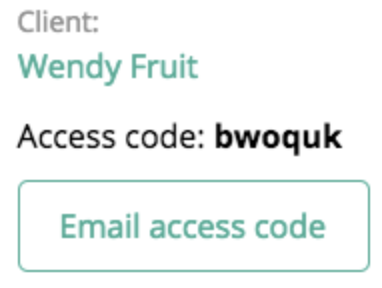 If you have an email address and/or mobile number for your patient, you can send this access code to them. Otherwise, they will need to write it down. Go to Clients and select the client in question. Click on "View program" to open the current exercise program in the program editor. Click on the "Settings" button to in the top right corner to open the program setting. Click on the "Email access code" button to send the access code to the client. How do I design and assign an exercise program to a client?